My first post went over the reasons behind the introduction of IEC 61439 and how following it can help specifiers get the outcome they want and avoid the undesirable ones. Here, I’m going to go over some technical reasons behind the temperature rise tests and the resulting need to define or prescribe the right and reliable rated current of the various components incorporated in the assembly. To see why, think about an electrical panel or switchboard designed for a train operating in, say, Mumbai or another similarly hot environment. At first, everything works fine. But, then one day the heat and accelerated ageing phenomena it causes catches up to the electrical gear, with the result being fireworks – a scenario that might have happened when a Mumbai monorail caught fire. More than that, the overheating, if not detect, can move to thermal runaway (technical thermal avalanche) and create short-circuit or internal arc inside the assembly. 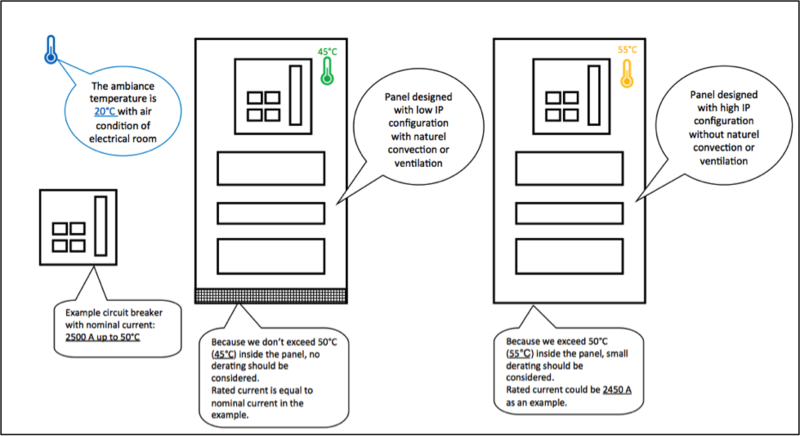 So, the testing in IEC 61439 verifies that temperature rise limits are acceptable for different components of the assembly, including busbar, connections and functional units. Each circuit alone and all collectively must be able to carry the rated current without excessive hot spots. Such testing, however, also must take into consideration real-life conditions. Suppose the room ambient temperature is 35oC, (reference temperature of the IEC 61439). In that case, a typical temperature rise inside a cabinet could push many of the components to their specified environmental limits, increasing the chance of failure. By the way, 35oC is about the average high temperature for Mumbai in April, Houston, USA in August, and Madrid, Spain in July. The example below explains why sometimes it’s important to use the rated current given in the documentation of the original manufacturer, as technical guide, to ensure respect of the temperature rise limits. We should manage the nominal current defined and validated on a device alone in the free air to a rated current into an enclosure where we install the same device with others. Due to the increase of the internal air ambient, the rated current shall be adjusted to guarantee the performance during the life of the assembly. Example of derating for an electrical room without air conditioning. 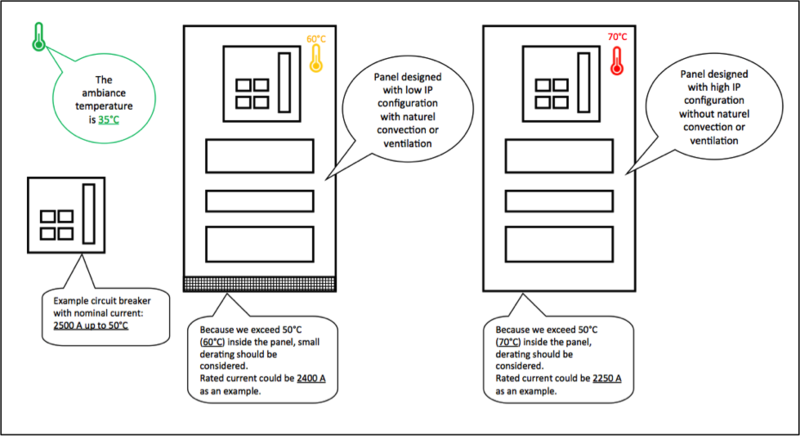 Some customers, with more usage in critical buildings, can use the panel in an electrical room with air conditioning. If so, then the rated current shall be adjusted. Example of derating for an electrical room with air conditioning. IEC 61439 section 10.10 states that busbars and functional units should be tested. These evaluations are done using the worst-case conditions. So, busbars must be mounted in the assembly enclosure with all normal covers and partitions in place, and the tests must be done at the rated current. Functional units shall be mounted in the enclosure as they would be in normal use. Again, all covers and internal partitions must be in place. Also, as before the rated current should flow through each unit, with this multiplied by the diversity factor. This recognizes the fact that not all functional units will be at their maximum rated load at the same time. Thus, the energy dissipated as heat will not simply be the sum of the maximum of each individual component. Instead, it will be somewhat less, with this determined by the diversity factor. The maximum temperature is 140oC for copper busbars, 125oC for individual components (in accordance with the component manufacturer’s instructions), and 105oC for external insulated conductors. The last limit is lower because the performance of insulation degrades with temperature to a greater degree than does bare metal performance. This is important in situations where support links are insulated. 70oK for terminals, external insulated conductors (105°C-35°C). For insulated busbar support, then the minimum temperature for that part would be 140oC. Going through such a derating ensures that individual parts of the assembly will not degrade or fail. It also guarantees that the entire assembly will safely and reliably function for its operational lifetime. Finally, it means that electrical panel specifiers and designers can concentrate on other aspects of the project, without having to worry about safety and service continuity failures. Maybe following IEC 61439 would have kept the monorail mentioned above – and other trains – running on time. Instead, the line shut down for hours, making the daily commute challenging. The next post in this series will cover clearance and creepage distances, why they are important, and how to ensure they meet the standard. Schneider Electric has a complete range of main and distribution busbars, prefabricated connections and distribution blocks, and thermal rules in its catalog. For more information on our offering in this area, click here. Learn how to improve your “zero accident” safety policy with our electrical safety training.